At idle, air passes through this hole along with air passing through the idle speed screw orifice. If you screw the idle speed screw all the way in, the only air that gets to the engine is through this hole and through the auxiliary air regulator if it’s still open for whatever reason – engine cold or regulator not closing when hot a it should. Now we need to tie ignition timing in to the mix. If a vehicle idles with the timing set at zero degrees for instance, or 7. 5 or 5 after TDC or whatever, rotating the distributor in the advance direction, the idle speed will increase. If one retards the timing, the idle speed will decrease. Now a vehicle designed for a 2 hose – vacuum retard and advance – distributor is designed to idle at 5 degrees after TDC. And there will be a range of idle speed – one should be able to turn the speed screw all the way in and expect the engine to die from too low and idle and if one turns the screw out, the speed should be able to be brought up to a speed significantly higher than the proper idle speed. 800 RPM for instance. Now imagine and engine designed for a single hose vacuum advance with mechanical advance too. Proper timing 7.5 degrees for instance. If one decides to retard the timing to 5 ADC, the idle speed will decrease so much that even with the speed screw all the way out, it’ll probably die. In other words, impossible to set a proper idle speed. But if one drills a hole in the flap, then the speed will go up. That’s why 2 hose distributor equipped vehicles require the hole in the flap – to have enough air bypassing the throttle body (passing through the hole in the flap is essentially the same as bypassing the the flap – has the same effect – higher idle – as aux air reg when it’s open when cold, for instance) to supply enough air. Also, realized this is measured air – measured by the air flow sensor so it’s compensated for by an increase in fuel delivery at the injectors. For all you need to know about the air flow sensor, click here then scroll about half way down the page to “Intake System Air Leaks” and read on. You won’t find this stuff anywhere else. And since were talking timing and timing is part of a tune up, take a look at this too, it’s right here. And that’s why if you put a distributor designed to have the timing set at 7. 5 or 10 degrees advanced (Bosch 009 for instance) in a vehicle designed for a 2 hose distributor designed to be set at 5 degrees after top dead center, since a vehicle with this distributor should have a flap with a hole in it, you’ll never be able to set the idle speed at 800 RPM, even with the speed screw all the way in. The same principle applies to 72 though 74 bus engines with a 2 hose distributor meant to have the timing set at 5 after top dead center. You’ll never be able to set the idle at a proper 800 rpm or so with a distributor such as the 009 where the timing is set at 10 degrees before top dead center. Realize this is 15 degrees different (advanced) than the original. Thinking back a few paragraphs, you can see that this kind of change results in a dramatic change in idle speed and the only way to compensate is to change throttle bodies. Closing the hole in the flap may work – I’ve never tried it. The solution to this problem is to install type 3 carburetor throttle bodies – the part with the flap. With these throttle bodies, the idle speed will be able to be properly set. However, one may need to change the pilot jet for proper response when adjusting mixture. The “third carburetor” – that’s the speed and mixture screw at the backside of of the left side carb – disconnect the wire from the cutoff if it does work. And whether is does or not, screw the speed and mixture screw all the way in and plug the outlet pipe that leads to the right side manifold. You want this system completely disabled. Plugging the inlet fed by the air cleaner is ok but turning the air screw all the way in should do it. 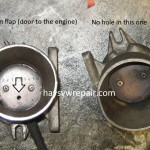 Closing the hole in the bus throttle body flap may be a solution – I’ve never tried it. But you’ll find the orifices in the type 3 body itself are significantly bigger than those found in the original bus carburetor bodies. This is good for off idle performance – richer mixture. Even after all that, you may find your vehicle stumble off idle or at low RPM cruising at about 35 mph in third gear for instance. The non removable idle air bleed orifice found in the bus carb is about half the diameter of the type 3 version. The bus air bleed is about 1 mm in diameter. The type 3 version is about 2 mm in diameter. If you have stumbling problems with you bus bodies with orig size air bleed, drill it out to about 1.8 to 2 mm and it should solve the problem. The first clue to the above issue is finding that when adjusting the mixture screw, one has to turn it nearly all the way in (not bottomed out) for smooth idle. One may find the best jet is the smallest one ever used – a 45. Idle emissions may be off the charts (very high hydrocarbons due to lean idle mixture). If the vehicle runs fine like this, no problem but it could be quite a polluter because the mixture is so lean, a lot of fuel is not being burned and exits the tailpipe as gasoline steam. Some vehicles will run fine like this. But drilling the air bleed hole bigger allows more air to enter the idle circuit thereby allowing for a bigger pilot jet and thus richer mixture resulting in a more complete burn and thus lower, more lung friendly emissions. This really works. Type 3 carbs all had approximately a 2 mm idle air bleed. It’s really an air correction jet just for the pilot (also known as the idle jet). The result will be the typical abrupt drop off from idling when screwing mixture screw in to a quick, strong revival when screwing the mixture screw back out. How many times I’ve seen this question answered in a hundred different ways on “that popular VW internet site” and they’re all wrong. Keep reading and I’ll teach you to fish.